When smiles are drawn over the eggs and bunnies knock at your door, you know that its time to bid adieu to the winters and welcome the beautiful Spring with the arrival of Easter. It is the day that celebrates the resurrection of the Lord Jesus from the dead and marks the end of a month-long fasting period. This is the time to celebrate with get-togethers and lavish feasts. Although Easter is a Christian festival, the tradition to celebrate Easter in the other parts of the world is much older. In the northern hemisphere, it is the first celebration after long dark winter season and is associated with the arrival of Spring after Spring Equinox. Spring Equinox is an astrological event that represents the movement of Sun on earth’s equator, making the length of day and night equal. This was an important event in many ancient civilizations which was completely dependent on agriculture to fulfill their basic needs. For them, it was the harvest time when they can grow crops again with the warmth of the Sun. That is why we can see the roots of Easter tradition in different parts of the world. Reading of this Year's Tarot Cards! The week of Easter begins with the first full moon of March equinox and ends with the first Sunday after that full moon. Easter is celebrated at the end of the week that is on the first Sunday following full moon. 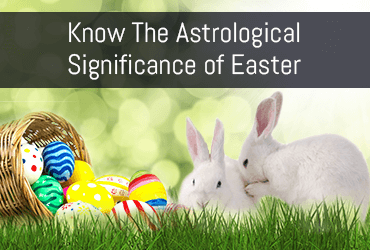 After the Spring equinox, the celebration of Easter has huge importance in the western astrology. How can we Connect the Events of Easter with Astrology? Easter is the only Christian event that doesn’t follow the #Georgian calendar. The date of Easter changes every year and the reason behind it reveals its significant connection with the Astrology. According to the New Testament, Lord #Jesus was resurrected on #Easter, two days after the crucifixion at the time of Paschal or Hebrew Passover. As per the lunar calendar, Paschal begins on the 14th day of Nisan after the spring equinox. The resurrection of Jesus is symbolic to rebirth and revival of life in the month of spring. If we look into astrology, we will also see the connection of zodiac with the story of Easter. The Hebrew month of Nisan begins with the first day of Spring. It is also the first month of the solar calendar that shows the transition of the Sun into Aries. The first zodiac, #Aries is represented by the symbol of Ram or male sheep which was considered as the holy sacrifice. Ancient Hebrews used them as Passover lamb to seek forgiveness for their sins in worship. Similarly, the Bible often refers to Lord Jesus as the Ram or “lamb of God” who sacrificed himself for the sins of people. The death of Jesus and revival in the month after Spring equinox describes rejuvenation of life in the astrological event of spring. You may get amazed that the roots of the Easter celebration are deeper than you expect. The Roman texts reveal its existence in the Pagan traditions. After long and dark winters, Spring equinox had been the most awaited event in Paganism. For Pagans, spring embarks the phase of fertility and rebirth. The word “Easter” is derived from the name of a Pagan Lunar goddess called Eostre or Eastre. She was considered as the powerful goddess of light and spring. The celebration of Easter was first begun in the honor of their Anglo-Saxon goddess to get the blessing of fertility and harvest. Read more: Fear of Falling in Love! Pagans are considered as the relatives of the Christian population that lived in the 4th century Rome. Due to this, the Easter celebration and most Christian holidays seem connected and mostly coincide with the Pagan traditions. The most followed one is the custom of dying Easter eggs and gifts of bunnies. The symbolic bunnies and easter eggs are somewhat the traditions risen from the Pagan mythology. According to the legend, the goddess Eastre found a wounded bird lying in the winter and turned it into a rabbit in order to save its life. But the spell was not complete so it didn’t affect its ability to lay eggs. And when the spring came, the rabbit showed its gratitude to the goddess by laying eggs as gifts. Thus, the custom of gifting bunnies and dyed eggs came into existence. Even these days, the eggs are gifted as a symbol of fertility in many cultures. While, in Christian traditions, these are exchanged to celebrate the resurrection of Jesus. Easter time is also a combination of the solar and lunar calendar as it occurs on the first Sunday following the fourteenth day of the lunar month after the equinox. As the celebration of Easter is after the Vernal equinox, its astrological evidence can be found in Jewish culture also. Easter is mostly celebrated on the 14th day of a lunar month that comes after the Vernal Equinox. The event of fertility lines up with the traditional Passover of jew which is often called as Pasch. In Jewish tradition, the Passover or Pasch is taken on the 15th day of the lunar calendar in the month of Nisan. Read more: What You Can Expect this Taurus Season? In Persia, the spring celebration and painting of eggs are a tradition of thousand years which is celebrated as #Zoroastrian new year. In Greece, this was the day on which the God of reviving vegetation, Osiris was born again. This also symbolizes the blooming of vegetation on the earth celebrating the fertility of nature. It is really amazing to understand how each tradition has Easter as its integral part. Funny bunnies, chocolates, dyed eggs, roll games, Easter bonnets all are magical owing to the fact that they are equally important with the astrological tilt of earth with cosmic stars. So, take a look over your daily love horoscope to know what Easter week has in store for you and make the most of this festive time.